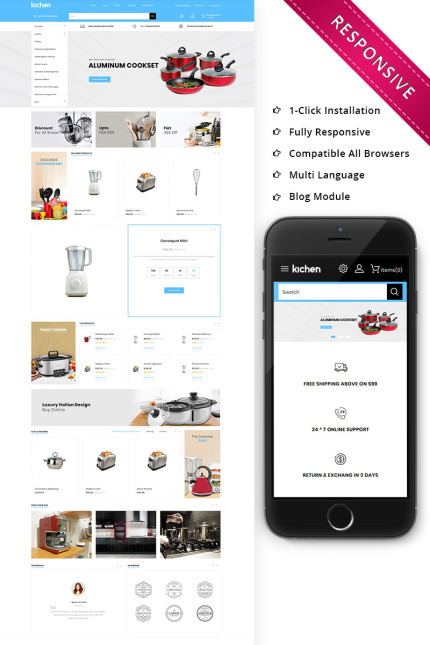 Kichen – Kitchen Accessories opencart Theme. It brings a new horizon in the eCommerce website design for Kitchen Accessories. Alan is developed to deal with kitchen accessories like Blenders, Mashers, Peeler, Grater, Whisks, Cutting Boards, Mashers, Colander, Food Mill, Knife, Ovens, Frying Pans, Knife, Food Storage and many more. Kichen is a responsive and Multiple Browser Supported Shopify theme. It has extra features like Pagination, Product Share, Product Review, Collection Sorting, Related Product etc.